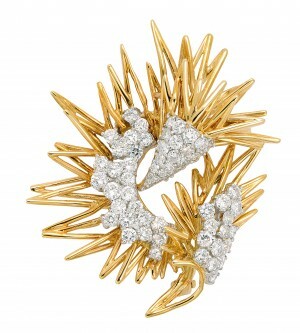 18-karat gold and diamond zigzag wire brooch by Kutchinsky. There’s been a noticeable resurgence in popularity lately of mid-century modern furniture, and suburban realtors are rejoicing now that those split-levels and cookie-cutter bungalows, once vilified as boring, are now subject to raging bidding wars. Merchandisers are perennially eager to capture the youth culture demographic, but it’s the baby boomers that are adopting and adapting the look to suit themselves; to borrow a term from the make-up counter and exercise gurus, essentially ‘youthifying’ their tastes. As they downsize their homes, the traditional French provincial and Sheraton furniture gets pitched out in favour of some sleek, low-slung import from Italy. Consumers of all ages and stages of life are highly attuned to this version of a modernist esthetic apparent in home d√©cor, fashion, and art. The influence shows up in jewellery, as well. Wine writers often encourage their readers to challenge and expand their taste buds away from easy drinking wines and go for something with a bit of an edge. It follows that there’s something to be gained from expanding one’s taste in jewellery design, too. A hallmark of the industrial style is its harder edge captured within a sculptural form. The solidity and heavier aspects of the designs contribute to the idea that one can easily conjure up and embrace an inner grunge persona. This deliberately hard-edged urban and urbane motif is suggestive of a hyper efficiency that transcends the common notions of what’s pretty. Any perceived toughness doesn’t in any way detract from the workmanship or design‚Äîsuave meets rogue can be a captivating combo, as anyone who’s ever dated (or been) a ‘bad boy’ can attest. Also, as the look inherently demands that attention be paid to it, shy wallflowers might find it a bit uncomfortable to wear; a confident attitude complements the best accessory. 18-karat gold ring decorated with a cluster of tiny ingots by Karl Stittgen. Audacious designs have ample proportions, with prominent industrial details boldly borrowed from and inspired by the world of architecture and building construction tools from the local big box hardware store. Generally, they’re neither light nor airy, but the innovative engineered concepts are composed of some funky aspect where controlled elements dominate. Interestingly, the designs do straddle a fine balance between futuristic and the middle of the last century, a commingling of time frames that actually works. This dialing backward and forward achieves an interesting harmony, an energetic synthesis of design principles. Canadian designer Karl Stittgen seems particularly adept at executing the industrial chic esthetic. 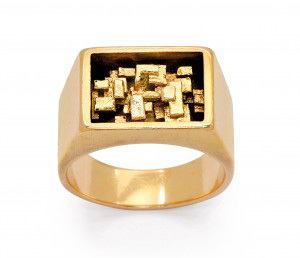 A sculptured ring has a design reminiscent of industrial metal filings‚Äîtiny gold ingots cluster in a boxy rectangular repository atop a chunky gold shank. Square sapphires and diamonds decorate an oval brooch consisting of an internal grid pattern that recalls a factory window divided by mullion bars. A wide gold bangle bracelet‚Äîcushion-shaped with a molten patterned texture‚Äîlooks as if it only recently emerged from its crucible. Simple, straightforward examples come from Cartier’s rivet screw motifs on Aldo Cipullo’s iconic ‘LOVE’ series and the wirework penannular bangles from David Yurman. An expansion bracelet by an unknown maker consisting of a series of unconnected tubular gold links of various lengths embodies a punchier, risky look. It’s sprinkled with small round diamonds set in double bezels and hides a surprising rubber O-ring interior. 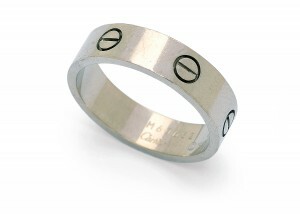 18-karat white gold ring with screw motifs from Cartier’s iconic ‘LOVE’ series. An electric current motif surges through industrial wire angles zigzagging like multiple crazed lightning strikes adorning a gold and diamond brooch from Kutchinsky. We can admire what looks like a refinery experiment gone wrong from the normally refined Van Cleef & Arpels, but of course executed with the house’s usual due diligence in a gold ring of crosshatched texture exploding with geometric clusters of pav√©-set diamonds. Designs that merge structural aspects of technical prowess, control, and manufacturing skill are powerful representations of non-traditional beauty contributing to a sense of liberation and non-restriction. This lack or deliberate absence of subtlety is what actually draws us in, and it’s a pleasant surprise to enjoy what’s essentially low-risk to dig a bit deeper into the offbeat. Think Indie rather than establishment or the virtues of vice. Another challenge to the status quo invites us to embrace the radical within and switch the focus to inner rock chick, at least temporarily. Save the string of pearls for another day.